The health, structure and functioning of our teeth and bones heavily rely on calcium. Surprisingly, only 1% of the calcium in our body is used for important body functions such as vascular contraction, nerve transmission and muscle movement. The rest of our body’s calcium supply is stored in our teeth and bones that are going through a continuous remodeling process throughout our lives. 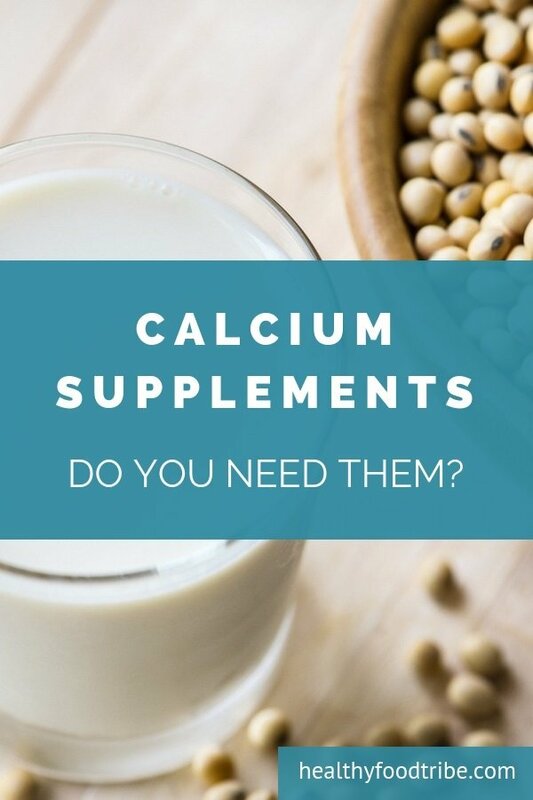 Calcium is in fact one of the most abundant minerals in the human body, but we need to rely on external sources such as foods, supplements and even medicines to get enough of this mineral in. The body can’t produce calcium on its own. To put this in perspective, a 70kg person typically has around 1.2kg of calcium in his or her body. Despite the fact that calcium is widely available in foods, deficiency is still quite common. A fancy word for calcium deficiency is hypocalcemia, which means low levels of this mineral in the plasma, or blood serum. Or in other words, a calcium deficiency can lead to hypocalcemia. Common causes are not enough calcium and/or Vitamin D in your diet, but also stress and anxiety can lead to this condition. Mild cases of deficiency can lead to symptoms such as overall fatigue, muscle stiffness and spasms, mood changes and memory issues. More severe calcium deficiency can ultimately lead to bone health related conditions such as osteoporosis, a decrease in bone density. Most cases of deficiency can easily be resolved by adding more calcium to your diet. Calcium supplements should really only be used when advised to do so by a medical professional, as too much calcium can be harmful and your body can’t process excess amounts of this mineral. Hypercalcemia, too much calcium in the blood, is the opposite of Hypocalcemia, and can lead to serious health issues. Older people and women who have had their menopause are most at risk of calcium deficiency. In addition, people with poor diet habits, or diets with little calcium and Vitamin D, also run the risk of becoming deficient. Calcium is a mineral that can be found in a great variety of different foods, in particular dairy sources such as milk, cheese and yogurt. If you don’t eat dairy foods, not to worry, there are lots of other sources of calcium you can eat. Vegetable such as kale, broccoli and cabbage are rich in this important mineral. And if you love fresh bread, you’re lucky, because one slice of white bread contains on average 73mg calcium and a slice of whole-wheat bread gives you 30mg of this mineral. In addition, orange juice and most cereals are also good sources of calcium. Similar to magnesium supplements, there are different types of calcium supplements. For this mineral to be effective, it needs to be taken with other Vitamins and minerals for it to get absorbed by our body. Vitamin D is calcium’s best friend, but also magnesium and Vitamin K play an important role in the effectiveness of calcium supplements. Most calcium supplements therefore also contain magnesium and Vitamins D and K.
What are the most common types of calcium supplements? By far the most common form of supplement, calcium carbonate typically has a high elemental calcium content but doesn’t absorb as well. In other words, its bio-availability is low. Calcium carbonate supplements should be taken with meals as it needs digestive acid to be absorbed. The citrate form of calcium is derived from citric acid which greatly enhances absorption and can be taken without food. The drawback is that the elemental calcium content is typically lower than with calcium carbonate supplements. Calcium orotate is created based on orotic acids and is present in small quantities in almost all living organisms. Manufacturers of calcium orotate claim that this type of calcium supplement is more effective than for example calcium carbonate because it has a strong bio-availability. A drawback is that the elemental calcium content in orotates is low. Made entirely from plants, algae-derived calcium is becoming more popular as a new form of calcium supplement because of the all-natural aspect. Carbonate and citrate are the two main forms of calcium supplements and are most commonly sold. Although not as widely available, calcium orotate is becoming increasingly popular as a supposedly more effective dietary supplement. Similarly, algae-derived calcium supplements have had a surge in popularity in recent years based on the idea that plant-based supplements are naturally better than calcium supplements sourced from rock and limestone (such as carbonate and citrate). With literally thousands of calcium supplements available on the market, it’s hard to differentiate between good products and products that are no more effective than a placebo. Here is our list of the best magnesium supplements you can find online. These products are selected based on factors such as brand trustworthiness, public reviews, pricing, ingredients, bio-availability and sales figures. New Chapter has long been a best-selling manufacturer of vitamins and supplements and their Bone Strength calcium supplement is no exception. Known for their plant-based, whole-food approach to supplements, New Chapter offers calcium derived from natural algae in this dietary supplement. Each serving (3 tablets) gives you 770 mg of calcium, as well as additional Vitamin D3 for better absorption, Vitamin K2 to help direct calcium to your bones and a good dose of plant-based magnesium. This top quality product is packaged with 30, 60 or 120 tablets with the 120 tablets bottle selling at the most competitive price. Kirkland Signature is Costco’s trusted private label brand enabling Costco to sell top quality products at competitive prices. 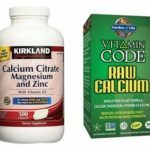 The Kirkland Signature calcium citrate supplement is one of the most popular calcium supplements available online. 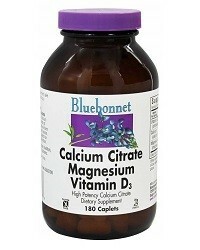 A standard bottle contains 500 tablets containing 500 mg of calcium citrate per serving of 2 tablets. In addition, each tablet contains generous amounts of Vitamins D3 and B6, calcium and zinc. Please note that the Vitamin B6 dose is exceptionally high so it’s recommended to not take more than the recommended serving. Bluebonnet Nutrition has been offering the finest, high-quality supplements in the natural products marketplace since 1991. Their calcium citrate supplement contains 1000 mg calcium per serving, which equates to 100% of your recommended daily intake. One serving also offers generous amounts of Vitamin D3 and magnesium to help with absorption of the calcium. One bottle contains 180 tablets or 45 servings. Nature’s Bounty is one of the most well-known manufacturers of vitamins and nutritional supplements, dedicated to quality, consistency and scientific research. This calcium carbonate supplement contains a very generous 1200 mg of calcium per serving, supported by a good dose of Vitamin D3 to improve the calcium absorption. This competitively priced calcium supplement is offered in bottles containing 120, 220 or 240 tablets with 2 tablets equating to one serving. Just like the New Chapter Bone Strength supplement, this raw calcium supplement by Garden of Life is derived from algae. Garden of Life is a manufacturer of vitamin and mineral supplements, probiotics and protein powder using a whole-food approach. Their raw calcium capsules contain not only calcium but also magnesium and Vitamins C, D3 and K, based on a whole food plant formula. You can choose between 60 or 120 capsules, with each serving (4 capsules) containing 756 mg of raw calcium naturally occurring in algae. The Vitamin D3 content ensures better absorption and the Vitamin K supports bone health. This vegetarian product is organic, gluten and dairy free, without any binders or fillers. The IntraCal calcium supplement provided by Global Healing Center is of the calcium orotate type, meaning it is well absorbed by the body. One bottle holds 45 capsules with each serving of 2 capsules containing a generous 1100 mg of calcium orotate and 550 mg of magnesium orotate. With so many calcium rich foods available, calcium supplements are usually not necessary. Calcium deficiency can still occur though, even if you’re maintaining a healthy diet. If you are calcium deficient, a supplement can certainly help resolve that issue if diet changes don’t help. It’s important to note that too much calcium is never a good thing. Excess calcium doesn’t get absorbed and can even be harmful. Therefore, only use calcium supplements when you really need to, and stick to the recommended daily dose. Last but not least, exercise also helps to make your bones stronger and slow down the process of bone loss.